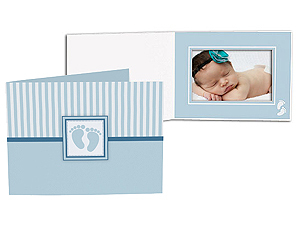 This 5x7 Horizontal cardstock folder is perfect for baby showers, birth announcements or newborn baby photography. This Blue Baby Footprints Photo Folder has a classic blue and white striped design on the front cover along with an icon of baby footprints in the center. It's perfect for baby showers, birth announcements, newborn baby photography or sonogram/ultrasound photos. Use as is or imprint with your personalized text. Can also be used by Hospitals to send new Moms and Dads home with a photo of their new baby boy.